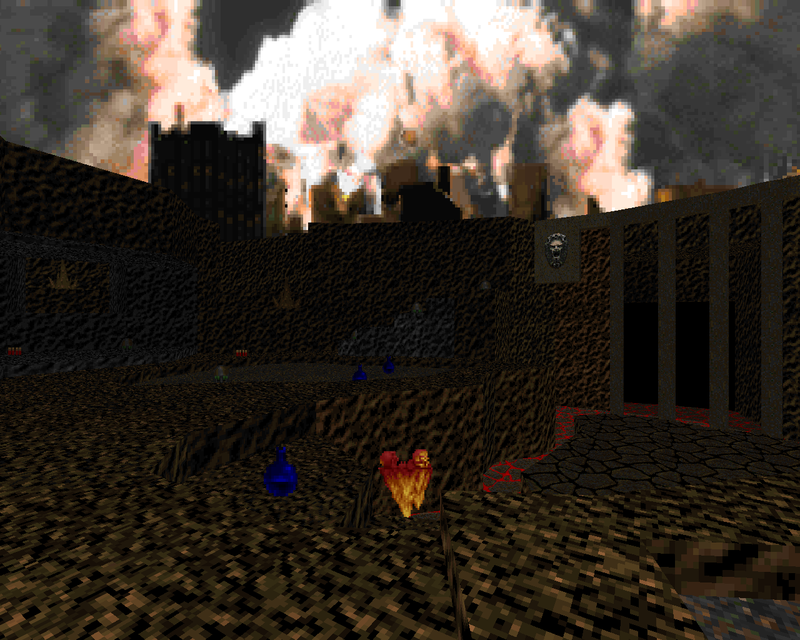 The author's previous release, Sticky Blood, featured a yard as the vast majority of its playing area. Here, Memfis is a bit more literal. 2011's Not In My Courtyard wears its inspiration on its sleeve. 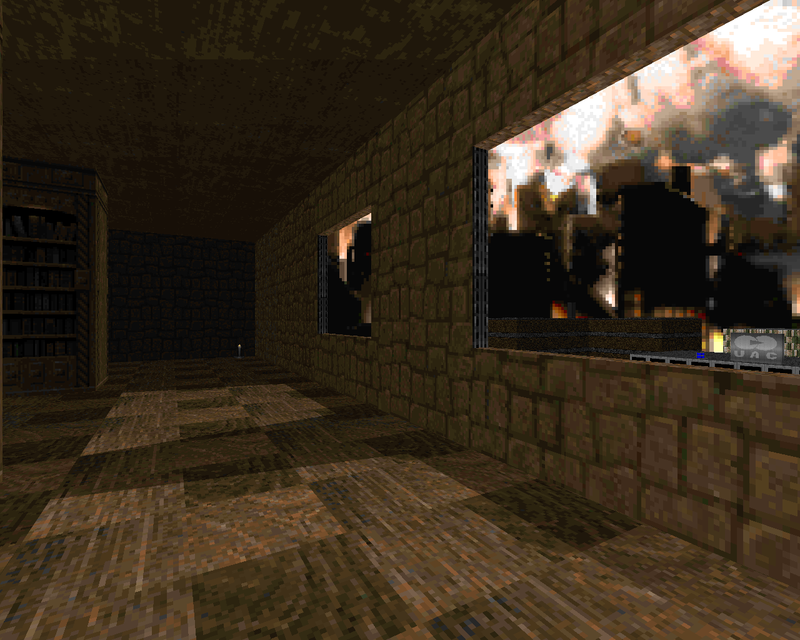 It's inspired by Doom II's MAP18, occupies the same slot and thus leverages the burning city sky of the second episode, and uses a FreeDoom track that's a slowed-down derivative of "Waiting For Romero to Play". There are definite differences, though, which you'll find out as you make your way through. My memory of the original isn't perfect but I'm pretty comfortable in saying that this Russian remodel is much harder. Not crazy tough, mind you. 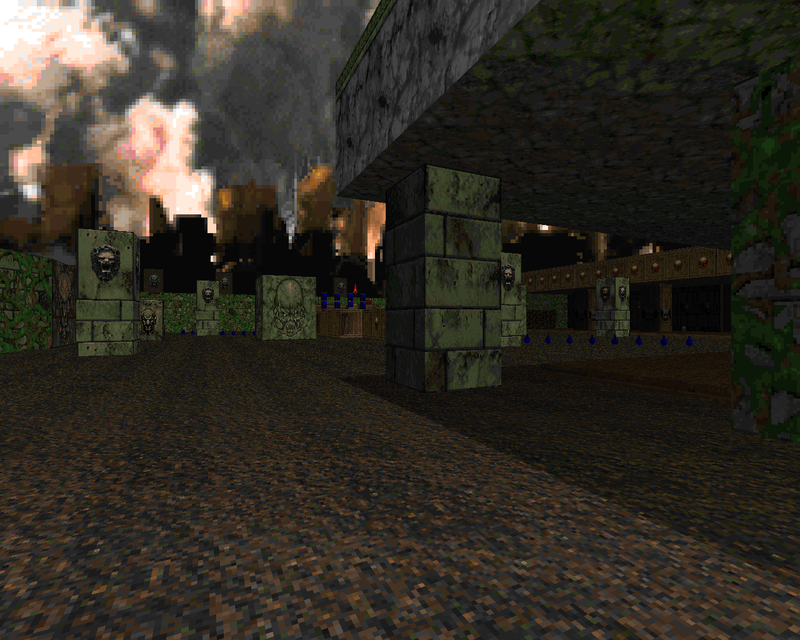 Memfis suggests that the player aim carefully and make use of infighting whenever possible. I'd watch my health, too. MAP18MEM has some sharp shocks but the specter of attrition looms over your head during much of the playthrough and you'll feel it from the very start what with hitscanners thrown into virtually every area like a dash of spice. They're only a fraction of the monster population when you first enter the titular courtyard but the zombies are just as scary as anything else, if not more so. 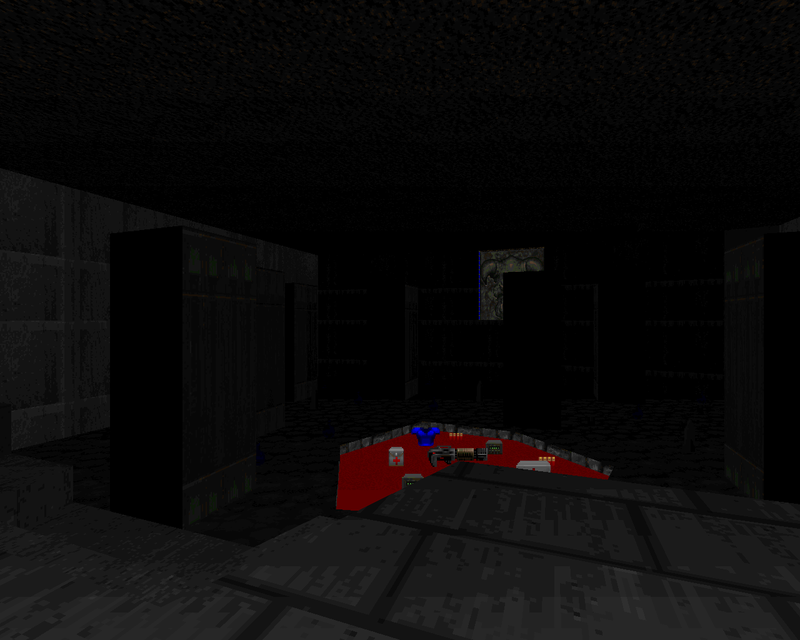 There are a couple of reset buttons like a berserk pack and a secret soulsphere but you have to figure out how to reach the latter and the former is in a small network of tunnels with a carpet of smoldering embers. If that last bit sounds familiar, it's because the author took a few of MAP18's most memorable features and put his own particular spin on them (MEMfis or MEMory?). The raw elements are present but the execution is different and not just because there are a grand total of six arch-viles lurking around the entire level to give you a good thump. The opening segment is completely different and has a nice naturalistic crater and associated cavern for you to explore as you handle combat of a more claustrophobic color. There are quite a few beasties in the courtyard when you first arrive but the big teleport ambush doesn't happen until the end. It's way crazier, too, but if you've picked over the map before unleashing Hell then you ought to have a BFG and access to an invul sphere. The combat is pretty engrossing but I think that the DoomCute embellishments are my favorite bits. Memfis tried to work a bunch of things in here including a little gatehouse with fireplace; a scene of butchery; and the rooftop visible from the northern library wing. The skyscraper detailing is understandably basic but you can see one of the UAC's many corporate outlets. It really helps to ground the level within the Hell on Earth setting with the city showing increasing signs of demonic corruption a la the doomed Deimos base. I also like the barred-off cavern that you appear to have just come from. 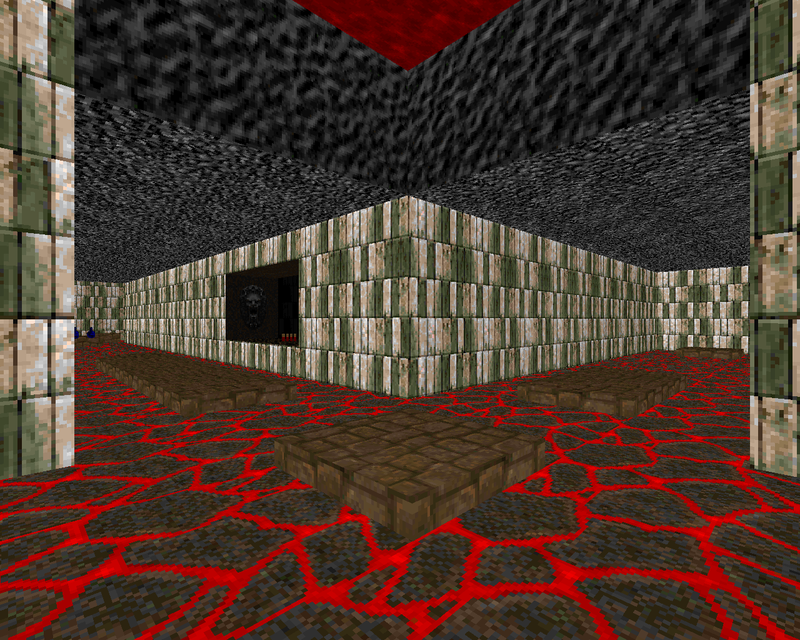 I'm imagining a larger world composed of Memfis-reimagined Doom II levels and I daresay it would be pretty fun to play through. You'll probably die as you feel out what kind of dangers lurk in the various paths branching off the central yard. I know I did. The author has included difficulty settings but as far as I can tell the only thing that they do is add more ammo on HMP and HNTR. It doesn't seem like much but it may be enough to enable a conservative playstyle as opposed to engineering infighting in dangerous conditions or desperately pushing forward in search of much-needed supplies. Tight balance has always been one of Memfis's signatures, though, if nothing else. If you're good with not being able to easily rebound from blunders then you ought to try this interesting take on "The Courtyard".